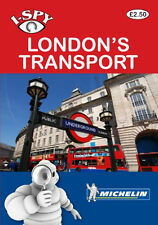 I-Spy London Transport is full of colour colour photographs, which you have to I-Spy. The aim is to tick them off as you go and collect points. Have you ever noticed what's below your feet, above your head or out of your car window?. Ladybird book Series 536 - First edition from 1981 - 50p net. 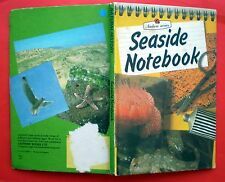 "Seaside Notebook". Discover the seashore in this fascinating book, helpful photos, best for 8 and up collectors. Cover marks/rub, flyleaf small writing, all else very good - stiff,clean, bright, colourful. Fantastic Optical Illusions. An Interactive Pop-Up Book. 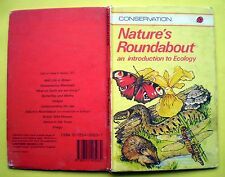 Hardback book published by Golden Publishing in 1994 - 1st edition. Illustrated in colour. The book is in VG clean condition. NICE USED 180 PAGED HARDBACK BOOK. TITLED 101 THINGS FOR GIRLS TO DO. BY LILLIE B AND ARTHUR C HORTH. PUBLISHED BY B T BATSFORD IN 1941. THE BOOK HAS BLUE COVERS. From Ladybird's Series 633, which features practical activities and hobbies. 'Tricks and Magic' demonstrates with clear instructions and pictures by Robert Ayton how to perform a variety of tricks with coins, cards, handkerchiefs and matches ('Use safety matches only') which will amaze and impress your family and friends. Churches And Cathedrals. H. & R. Leacroft. Puffin Picture Book No.108. VG+. Puffin Picture Book No.108. Stapled booklet. Paperback. Reprint. Landscape format. Colour and black/white illustrations. Staples not rusted. VG copy. # See pic 3 for contents. 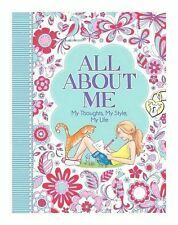 All About Me by Ellen Bailey (Paperback), Children's Books, Brand New. Condition is New. Dispatched with Royal Mail 2nd Class. I-Spy On a Ferry is full of colour colour photographs, which you have to I-Spy. The aim is to tick them off as you go and collect points. Have you ever noticed what's below your feet, above your head or out of your car window?. Author:-Haab, Sherri. Title:-The Shrinky Dinks Book. Author(s): Stephen Munzer. Title: Making Dinosaur Robots From Junk. Binding: Hardcover. Condition: Good. Product Details. I-Spy History contains up to 200 colour photographs, which you have to I-Spy. The aim is to tick them off as you go and collect points. Have you ever noticed what's below your feet, above your head or out of your car window?. You’ll enjoy it all more if you take it easy. Have you ever noticed what's below your feet, above your head or out of your car window?. Now you can discover the world around you with 50 pocket sized I-Spy books to choose from. I-Spy Lake District contains up to 200 colour photographs, which you have to I-Spy. The aim is to tick them off as you go and collect points. The Lake District is a very special place. Have you ever noticed what's below your feet, above your head or out of your car window?. Ladybird book Series 651 - First published 1965 - 15p net. "Animals And How They Live". A fascinating book, truly gorgeous illustrations, best for 8 and up. 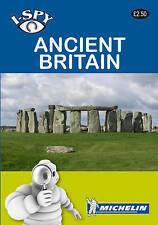 I-Spy Ancient Britain contains 118 colour photographs, which you have to I-Spy. The aim is to tick them off as you go and collect points. Caves people once lived in to grand and established buildings such as castles and cathedrals. AUTHOR: Stephen Munzer. TITLE: Making Dinosaur Robots From Junk. BINDING: Hardcover. CONDITION: Very Good. Acceptable - Very well read. Reading copy only. May have significant wear and tear and contain notes & highlighting. Ladybird book - 1972. All very good -clean, bright, colourful. This paperback book is in EXCELLENT condition. 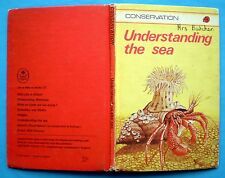 Ladybird book Series 651 - First published 1972 - 24p net. "Insects And Small Animals". A fascinating book, truly gorgeous illustrations, best for 8 and up collectors. Title: Brown Watson The Human Body (Hard Back Book) Item Condition: used item in a very good condition. Publisher: Brown Watson ISBN 13: 9780709717751. Binding: Hardcover Language: english. Book Details. A New Spiral Bound Hardback Book Includes 300 Multicoloured Bands, Loom & Hooks. = 900 Loom Bands For Hours Of Fun. PLUS ANOTHER 2 x 300 BANDS FREE (Which May Vary In Colour From Photo). 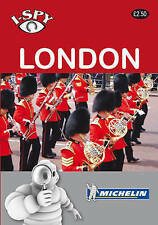 I-Spy Flags contains 118 colour photographs, which you have to I-Spy. The aim is to tick them off as you go and collect points. In I-Spy Flags you find national flags for many countries. Have you ever noticed what's below your feet, above your head or out of your car window?. EAN: 5038728063811. PUBLISHER: Tobar. NOTES : • Set of Facsimile’s of the Ladybird 1960’s Series 633 • TRICKS AND MAGIC • THINGS TO MAKE • EASY-TO-MAKE PUPPETS • With Slipcase. Weight Under: 1.0Kg. Check Out Our Books & Even More Books Selection! I-Spy Edinburgh contains up to 200 colour photographs, which you have to I-Spy. The aim is to tick them off as you go and collect points. Have you ever noticed what's below your feet, above your head or out of your car window?. The ultimate book of things to make, play, create and do. and it's boys only! With over 100 amazing projects there is enough here to keep busy bodies occupied all year long. Split into three sections - things to make, things to do and things to know; "The Boys' Book of Things To Make" is a good source of information as well as fun. The aim is to tick them off as you go and collect points. Have you ever noticed what's below your feet, above your head or out of your car window?. Now you can discover the world around you with 50 pocket sized I-Spy books to choose from. I can draw Magical Creatures drawing guide. A step by step drawing guide for drawing magical creatures from Unicorns to goblins. Book looks brand new there are no creased, teared or written on pages and it has only ever been used once or twice. Comes from a smoke free home. Street Magic Binder by Hinkler Books (Book, 2016). Condition is Like New. Dispatched with Royal Mail 2nd Class. DENNIS & GNASHER BY BEANO BOOKS - PAPERBACK. BIGGEST PUZZLE BOOK EVER! THIS BOOK IS FILLED WITH LOTS OF DIFFERENT PUZZLES FROM WORD SEARCHES TO QUIZ'S COPY DRAWINGS, AND MUCH MORE. IN VERY GOOD CONDITION OVERALL, HOWEVER JUST A FEW OF THE PUZZLES COMPLETED USING PENCIL BY MY SON. Title: Ultimate Lego Ideas Collection. Title : Ultimate Lego Ideas Collection. TOYS & LEGO. Binding : Hardcover. Product Category : Books. First Edition : False. Condition : Very Good. Signed : False. Ladybird book Series 651 - First published 1965 - 24p net. "Animals And How They Live". A fascinating book, truly gorgeous illustrations, best for 8 and up. Cover marks/rubs, all inside very good - stiff,clean, bright, colourful.